The Apollo 55000-804 is a specialist single output interface module. This unit is designed to be DIN rail mounted and is compatible with the Apollo XP95 and Apollo Discovery analogue addressable protocols. This unit is ideal for use where space is at a premium. Several of these devices can be installed on a single DIN rail in a fraction of the space of the regular Apollo boxed interface range. 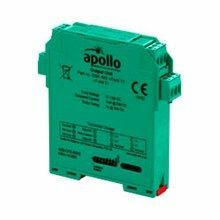 The Apollo 55000-804 provides a single set of voltfree output terminals which as default change state on activation of the fire alarm system. If you’re interested in the Apollo 55000-804 interface unit you may also be interested in our Apollo Discovery Detectors and Apollo XP95 ranges.